Freshman striker Marques Wright looks for where he can kick the ball during the Bombers’ win against Bard College on Oct. 7 with a score of 5–0. Wright was a walk-on to the men’s soccer team in the 2017 season. After a hectic recruiting process, Marques Wright, freshman striker on the men’s soccer team, chose to attend the one school he was not recruited by. He said he decided to come to Ithaca College because of the law program, but had to fight for a spot on the men’s soccer team. Wright is one of 450,234 U.S. high school boys who participated in varsity soccer in 2016, according to the 2016–17 High School Athletics Participation Survey conducted by the National Federation of State High School Associations. In a standout senior campaign at Liverpool High School, located northwest of Syracuse, New York, Wright bagged nine goals in 19 games, dished three assists and led his team with 21 points to help guide Liverpool on a memorable run to both a sectional and league championship. Wright’s career year was capped off with the forward grabbing First-Team All-Section honors, and the recognition by his teammates and coaches as the Warriors’ Most Valuable Player throughout the 2016 campaign. According to the survey study, 4.7 percent of high school players continued playing soccer at the NCAA level. Even fewer — 2.3 percent — competed in Division III. But Wright said the next level was always in the cards and that his intention was to lace up again after donning the Warriors’ orange and blue for the last time. Though normally far from the tallest on the field at any given moment, Wright’s presence in front of the goal overshadowed his size difference and eventually caught the eyes of several college coaches and their soccer programs. Morrisville State College, Le Moyne College and Utica College showed a sincere interest in the Liverpool standout. Ithaca College, then led by former head coach Patrick Ouckama ’05, did not. But Wright was not only dead–set on playing college soccer: He said he was also motivated by his desire to obtain a degree in legal studies. 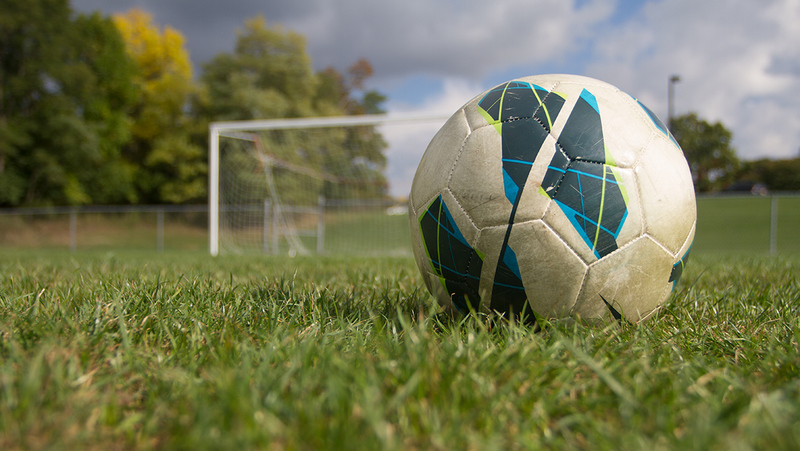 Scoring goals was one thing, but finding the perfect school that offered both a competitive soccer and strong legal studies program was an entirely different game. Wright eventually found what he was looking for at Ithaca College. But his decision came at a time of great uncertainty, as Ouckama had just stepped down as the Bombers’ head coach in April 2017 to pursue a position as the U23 and U15 head coach for New England Revolution Development Academy. A vacancy at the helm meant that Wright would have to wait for a new coach to be named before reaching out for a shot at the program. The Bombers’ current head coach, Kyle Dezotell, officially took over for Ouckama two months later, in June 2017. Dezotell arrived after a brief but fruitful spell in charge of the men’s soccer team at Manhattanville College in Harrison, New York, and at a pivotal time in his life, having just gotten engaged. But his arrival in the summer meant that Dezotell missed out on the recent recruiting window and was largely behind the eight ball in terms of identifying potential players for his program. Fortunately for Dezotell, one player made his job easier, as Wright was determined to play soccer on the South Hill. Wright made it a point to contact the new man at the helm of the men’s soccer program. He later recalled Dezotell’s response, including the whirlwind of events that led to his eventual invitation to preseason in August. Although it was only a chance, one that Wright said Dezotell offered no promises to, it was nevertheless a chance that Wright would take without ever looking back. That was the idea, Dezotell said, adding that he was surprised, based on a bit of research into Wright’s background, that the Liverpool native was never invited to preseason. Wright said he thought his performance at the clinic had fallen short. Dezotell said he spoke with Susan Bassett, the college’s director of the Offices of Intercollegiate Athletics and Recreational Sports, about raising the preseason roster limit from 35 players to 36. Bassett later approved, and Wright was officially invited to join the squad on Aug. 18. Having passed the first of several tests thrown in his direction, Wright’s make-or-break moment came in the team’s final preseason scrimmage against the University of Rochester. After a solid showing during the game in Rochester, New York, Wright said that Dezotell told him that it was the “top performance by a freshman.” The next day, Wright was informed by the coaching staff that he had made the final roster. Dezotell said Wright’s path to being part of the men’s soccer program was entirely of the freshman’s own doing. The freshman has come into his own lately and has played a respectable 129 minutes off the bench for the Bombers. Wright said that with time, he has felt more comfortable both in training and on the field. Junior captain Eric Hepler, a former walk-on, said Wright reminds him of his younger self in many ways. Wright said he is looking to repay Dezotell and the program. “All I want now is to help this team win,” Wright said.